The Black Polycaon occurs only along the west coast of the U.S. and into Arizona. It is a fairly large, black beetle about an inch long, and it does not fit the typical description of the Bostrichid beetles. All of the other species in this family (except for the Lyctus beetles now) have their head tucked downward and covered by the overhanging pronotum – that first section of the thorax – so that their jaws point downward. Their upper surfaces are usually roughened or pitted. The Black Polycaon has a very smooth upper surface and the head sticks straight out in front, and the male in particular has prominent mandibles that also are sticking straight out in front of the head. One of the best characters to identify this beetle, in addition to its large size and shiny black color, is how the first two pairs of legs seem to stick out sideways, as though they just cannot bend forward or under the insect. Some experts on the Black Polycaon will state that it only infests logs of softwoods or hardwoods, and that it cannot enter finished lumber products. Other experts tell us that infestations in furniture and plywood clearly indicate the beetle’s ability to infest the wood after it has been milled or used for structural or furniture purposes. In fact, it is hardwood plywood that is most often infested by the Polycaon, which is then used to build desks or other furniture. I have seen infestations of fine oak furniture, where the emergence hole of the adult beetle was quite noticeable in the exposed oak arm of a couch. These are native insects in the West, and they may come to lights at night. 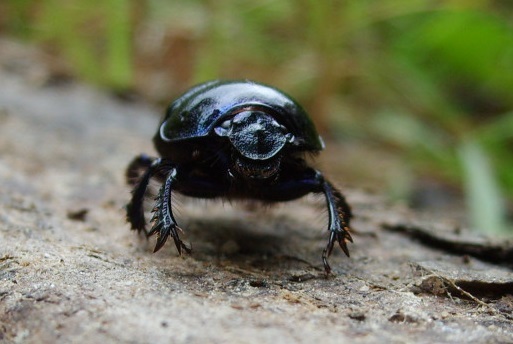 The mere presence of the beetles does not confirm an infestation of them in structural wood, although finding numbers of them indoors might suggest that something is going on inside. Not so for the other members of the Bostrichidae or beetles in the family Anobiidae. These include the familiar names of True Powderpost Beetle and Lead Cable Borer (Bostrichidae), and Deathwatch Beetle and Furniture Beetle (Anobiidae), all of which quite clearly are able to infest structural wood members. They complete their development and emerge as adult beetles which then mate and deposit eggs right back into that same wood for multiple generations. Or, even worse, they may choose other woods in the structure and expand the scope of the problem. For some of them a hardwood is a hardwood, and going from cherry cabinets to oak floors is not a problem. But, as it is with any pest management situation, we must begin with proper identification. There are a great many different kinds of beetles in North America, some of which look very much like those that feed on wood, and if the wrong diagnosis is made a very expensive control program might be initiated that is not needed. Their presence in structures is so uncommon and limited in scope that fumigation for them would not normally be necessary. Local treating with a borate on unfinished woods could eliminate any active larvae. The infestation is usually limited to just a few beetles, and once they are seen they likely are all past their stage in the wood. Repairing any holes and vacuuming the adult beetles would be the best approach in most cases.